Mediastinitis is inflammation of the connective tissue that surrounds the structures contained within the mediastinum. In sharp contrast to the acute exudative inflammatory response seen in acute mediastinitis, chronic mediastinitis is characterized by extensive and invasive fibro-inflammatory proliferation. Hence, it is often designated as fibrosing mediastinitis (FM) or sclerosing mediastinitis or simply as mediastinal fibrosis. The exuberant proliferation of fibrous tissue is triggered by a delayed hypersensitivity reaction to variety of infective or noninfective stimuli, resulting in compression of mediastinal structures; this leads to significant morbidity and at times even mortality. The infective agents often have a geographic distribution, for example, in North America; FM is commonly associated with Histoplasma capsulatum, whereas in Asian regions, it may be related to tuberculosis. In few reports, FM has resulted from infection with Aspergillus species. We report the first case of possible aspergillous FM in a young pregnant woman with a review in the last 10 years. A 26-year-old woman with 32-week amenorrhea had been admitted in a private health-care facility with complaints of headache for the past 20 days. This was followed by three episodes of generalized seizures and unconsciousness. A clinical diagnosis of eclampsia (blood pressure of 150/100 mmHg) had been made, for which emergency lower segment cesarean section was performed. She was treated with anticonvulsants, magnesium sulfate, and antibiotics. The condition stabilized over the next 2 days, but on postpartum day 3, she again had generalized tonic–clonic convulsions. Magnetic resonance imaging (MRI) of the brain revealed presence of tuberculomas in the right frontal and parietal regions. She was then transferred to our tertiary-care institute. On examination, her general condition had been fair; she was conscious and oriented. The pulse was 90/min and blood pressure was 150/100 mmHg. Apart from moderate neutrophilia (21,700/cmm), her other hematological and biochemical investigations had been normal. Serological workup for HIV and hepatitis B/C was negative. A repeat MRI of brain revealed a large (5.3 × 3.9 × 3.6 cm) heterogeneous mass (isointense on T1 and hypointense on T2) in right frontoparietal region with significant mass effect, which was interpreted as tuberculoma. She received antituberculous drugs, intracranial tension-lowering agents, and anticonvulsants. Despite the therapy, the patient developed severe headache, convulsions, left-sided hemiparesis, motor aphasia and increasing drowsiness, and finally succumbed. A complete autopsy was requested. Remarkable findings were seen in the mediastinum and the brain. The anterior mediastinum showed a large 9 × 8 × 6 cm slightly H-shaped [Figure 1]a, extremely firm to stony hard, partially capsulated mass with a pale yellow to focally congested cut surface. It had encased the superior vena cava and its tributaries, arch of aorta and its branches [Figure 1]b, the pulmonary arteries, the trachea, main bronchi, and proximal 4 cm of the descending thoracic aorta [Figure 1]c. It was also adherent to the esophagus and right lung hilum. 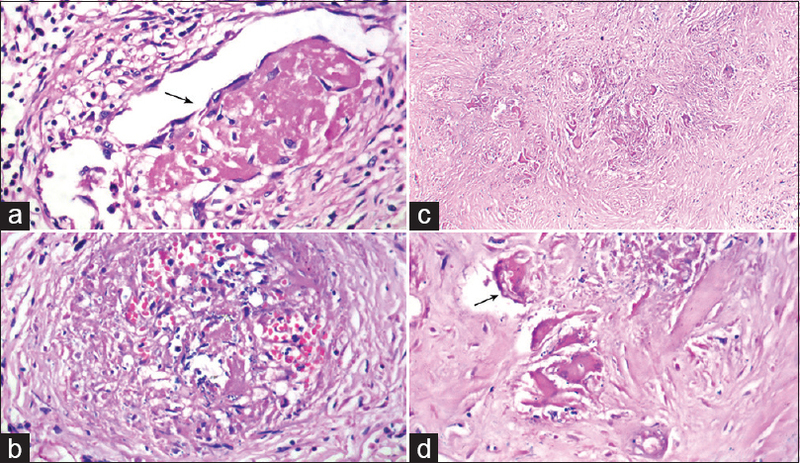 The mediastinal mass was essentially composed of densely collagenized fibrous tissue with foci of vascularisation, lymphoplasmacytic infiltrate, occasional aggregates of neutrophils and eosinophils, and scattered granulomatous reaction [Figure 1]d, [Figure 1]e. In many areas, there was abundant perivascular inflammation with focal vasculitis and luminal fibrin thrombi [Figure 2]a and [Figure 2]b. The central portion of the mass showed a large area of coagulative necrosis [Figure 2]c. The giant cells were of both foreign body and Langhan's types. The cytoplasm in some of them contained refractile, slender, and lightly basophilic septate hyphal structures [Figure 2]d. The fibro-inflammatory reaction had infiltrated into surrounding adipose tissue. Other structures were not involved. The brain was extremely edematous and very friable. On serial coronal slices, a large well-circumscribed, nodular, firm mass was seen in the right frontoparietal region [Figure 3]a. The histology showed dense perivascular mononuclear inflammation, granulomatous inflammation, and vasculitis with fibrin thrombi; many acute-angle branching septate fungal filaments were seen amidst and within the giant cells [Figure 3]a, [Figure 3]c,[Figure 3]d. Gomori methanamine silver stain confirmed the presence of fungal filaments [[Figure 3], inset]. Their morphology was suggestive of Aspergillus species. The kidneys showed acute tubular necrosis. Multiple sections taken from the lungs did not show any involvement; rest of the organs were unremarkable. In this report, we have presented a pregnant woman with neurological manifestations, who had a clinically undetected, circumscribed inflammatory mediastinal mass. It was composed of granulomatous reaction with intense fibro-collagenization replete with septate hyphae, which suggested the morphology of Aspergillus species. In general, both infective and noninfective cases of FM share similar histopathologic features, mainly in the form of edematous fibromyxoid tissue to dense lamellar or whorled collagenic fibrosis with prominent lymphoplasmacytic infiltration and obliterative vascultitis. Most of the infective causes of FM are due to fungal (especially Histoplasma) and mycobacterial infections. The agents induce myofibroblastic proliferation and collagen overproduction as an idiosyncratic reaction mediated via cytokines released by activated lymphocytes and macrophages. Added feature is the presence of granulomatous reaction, and such a “granulomatous infection-associated" FM is said to be localized, calcified, and often right-sided. Our case had a large, localized, H-shaped (possibly the thymic configuration) mass caused possibly by Aspergillus species. Since its first description in 1971, there have been only five cases,,, published in the last 10 years [Table 1], indicating that this is an uncommon manifestation. It is important to distinguish this mass-forming aspergillous infection from the mediastinal invasion and abscess formation seen in immunocompromised or immunosuppressed individuals. Akman C, Kanatarci F, Cetinkaya S. Imaging in mediastinitis: A systematic review based on aetiology. Clin Radiol 2004;59:573-85. Peikert T, Colby TV, Midthun DE, Pairolero PC, Edell ES, Schroeder DR, et al. 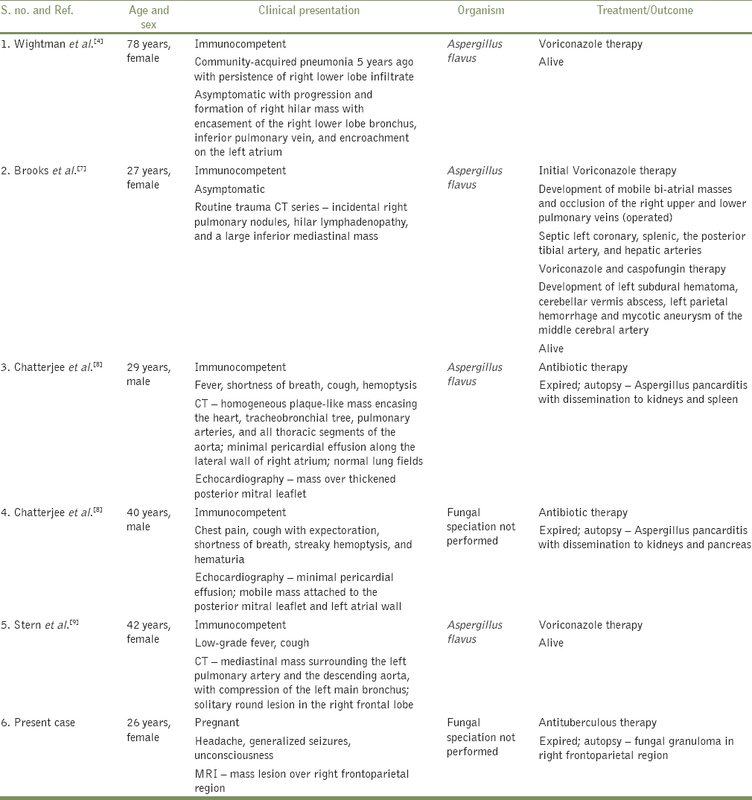 Fibrosing mediastinitis: Clinical presentation, therapeutic outcomes and adaptive immune response. Medicine (Baltimore) 2011;90:412-23. Hu Y, Qiu J, Liao J, Zhang H, Jin Z, Wang G. Clinical manifestations of fibrosing mediastinitis in Chinese patients. Chin Med J 2016;129:2697-702. Wightman SC, Kim AW, Proia LA, Faber LP, Gattuso P, Warren WH, et al. An unusual case of Aspergillus fibrosing mediastinitis. Ann Thorac Surg 2009;88:1352-4. Devaraj A, Griffin N, Nicholson AG, Padley SPG. Computed tomography findings in fibrosing mediastinitis. Clin Radiol 2007;62:781-6. Cohen DM, Goggans EA. Sclerosing mediastinitis and terminal valvular endocarditis caused by fungus suggestive of Aspergillus species. Am J Clin Pathol 1971;56:91-6. Brooks M, Royse C, Eisen D, Sparks P, Bhagwat K, Royse A, et al. An incidental mass. Lancet 2011;377:1806. Chatterjee D, Bal A, Singhal M, Vijayvergiya R, Das A. Fibrosing mediastinitis due to Aspergillus with dominant cardiac involvement: Report of two autopsy cases with review of literature. Cardiovasc Pathol 2014;23:354-7. Stern JB, Wyplosz B, Validire P, Angoulvant A, Fregeville A, Caliandro R, et al. 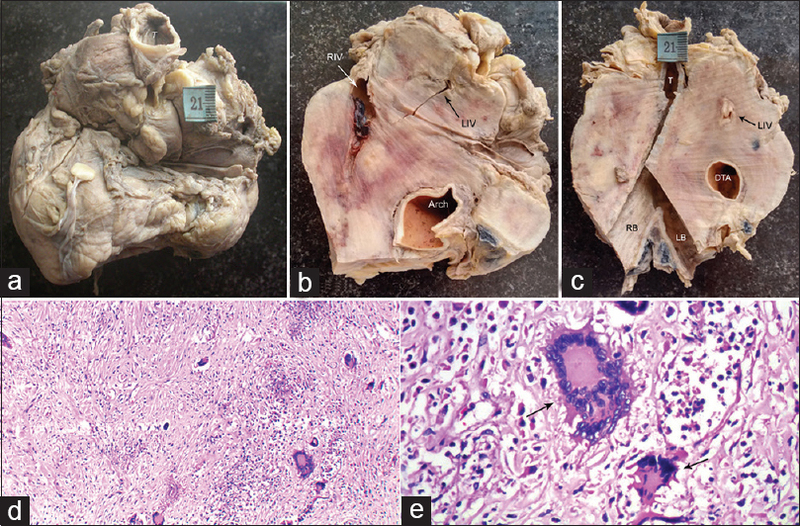 Bulky mediastinal aspergillosis mimicking cancer in an immunocompetent patient. Ann Thorac Surg 2014;98:1472-5. Athanassiadi KA. Infections of the mediastinum. Thorac Surg Clin 2009;19:37-45. Luppi P. How immune mechanisms are affected by pregnancy. Vaccine 2003;211:3352-7. Naik V, Ahmed FU, Gupta A, Garg A, Sarkar C, Sharma B, et al. 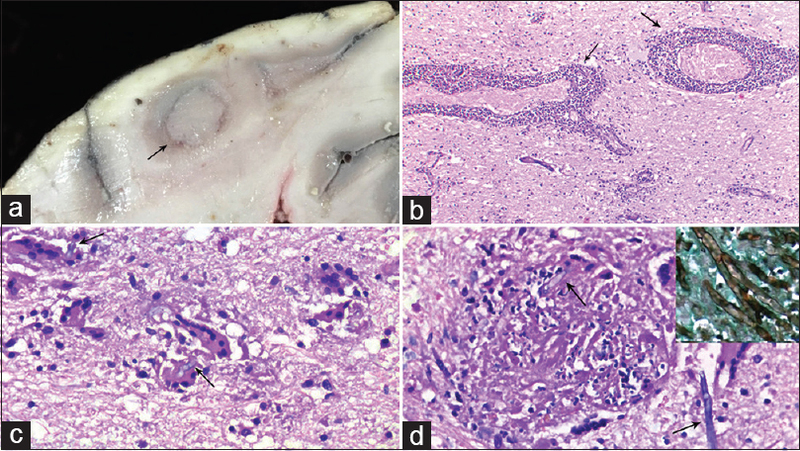 Intracranial fungal granulomas: A single institutional clinicopathologic study of 66 patients and review of the literature. World Neurosurg 2015;83:1166-72. Sheth D, Bautista M. Idiopathic fibrosing mediastinitis in young pregnant female-A rare condition. Crit Care Med 2014;42:A1661. Rutledge M, Salama L, Soufi MK, Al-Omari M, Khouzam RN. Fibrosing mediastinitis mimicking postpartum heart failure. JAAPA 2014;27:24-7.